To tell or not to tell – what’s in your personal brand? “Horribly wishy-washy.” That was the email response I got from my client Bob to a proposal which he had requested for a NFP board he is on, and which I had spent a couple of hours crafting. I thought I had done quite a tight proposal, but it turned out that the bit which had pushed Bob’s button was my “differentiation” material. I had originally written the template for that proposal because I had been asked to pitch for a high profile corporate job, somewhat outside my usual sphere of operations. Only one other pitch had been sought, from the doyen of that part of the trade. I reckoned there was little point in me doing a me-too proposal, and that my best tactic would be clear differentiation (oh, and price – can’t deny that). “Zentricity is a small consultancy I established following my retirement from full time involvement in the corporate world. It is not so much a business as an opportunity to live my purpose: helping people and organisations find clarity and direction. Is any potential assignment aligned with my purpose? Can I make a positive difference to clients or potential clients? I was a little surprised to win the corporate job. I am not sure how much of the win was price, and how much was the “differentiation”. But I deemed it to be a winning pitch, and trotted the template out for Bob, and got the reaction about being “soft”. I have had similar reactions before, when I think about it. I originally had a website with my brand name, which I had set up to support my small civil celebrancy practice. When I decided that that I should also have a web presence to support the consultancy business, my idea was to have a common, branded landing page with links from there to the celebrancy site, the consulting site and the blog. I tested that idea with a few trusted consultancy clients, and I was a bit surprised at their strong and unanimous view that I should keep the two sites separate. But in the light of their reactions I did just that. In another case, I have a joint venture partner together with whom I do occasional presentations, mostly under his firm’s brand. He is very much against me mentioning, in my self-introduction spot, that I am a marriage celebrant; so I don’t. So back to Bob – he is the client, he reckons he can read his board, and I don’t want to be fruitlessly standing on a soapbox. I changed the proposal to take out the differentiation material. The board is happy, and I have the assignment, but I can’t help feeing a bit ambivalent about it. Notwithstanding the strongly aligned views of my corporate colleagues, I still believe that the work I do can best be done with the right chemistry. I have managed to find that chemistry with some pretty hard-arsed denizens of the corporate world. The chemistry can only be real if I am being who I am, and the client is comfortable with that, without me hiding things. If that is part ageing hippie, part Buddhist fellow traveller, part lawyer, part business executive, part parson, so be it. In any event, anyone who googles either me or the brand (and who doesn’t check up on a potential business contact?) will turn up my dark hippie secrets. So I now have that common landing page, headlined by a quote from Rumi, despite the corporate misgivings which were expressed. Perhaps I am just being realistic, or perhaps it’s a statement – this is the kind of guy you’d be doing business with, take him or leave him. If it means potential clients would be put off, then most likely we wouldn’t have worked that well together, and they would be better off with someone from the bag-of-fruit brigade. I’m fine with that, because that is more likely to generate for them the necessary chemistry. Or maybe that’s the way things are going in this ‘slashie’ working world (e.g. hippie/corporate coach), where more and more people have portfolio careers; the fact that parts of the portfolio are quite different to other parts may be recognised as a benefit, with one part informing another rather than detracting from it. So what’s the harm in letting your personal brand reflect who you really are. What have you got to hide? Except those pictures taken in the bar in Ibiza, maybe. Does it ever feel like the strategic planning process is a game of ping-pong? Management brings strategy to the board, the board doesn’t like it; management goes away for another attempt, the board still isn’t prepared to sign off. I’ve seen this occur on plenty of occasions. One of the keys to effective strategic planning is of course iteration, but where the iterations are in fact second guessing, with management trying to read the board’s mind and invariably getting it wrong, a good outcome is difficult to achieve. The second guessing usually happens because the board is not clear about what role it wants to play in the planning process, and hasn’t given the appropriate signals. Management tries to respond by using ESP, and is generally about as successful in the process as husbands are in using that skill. 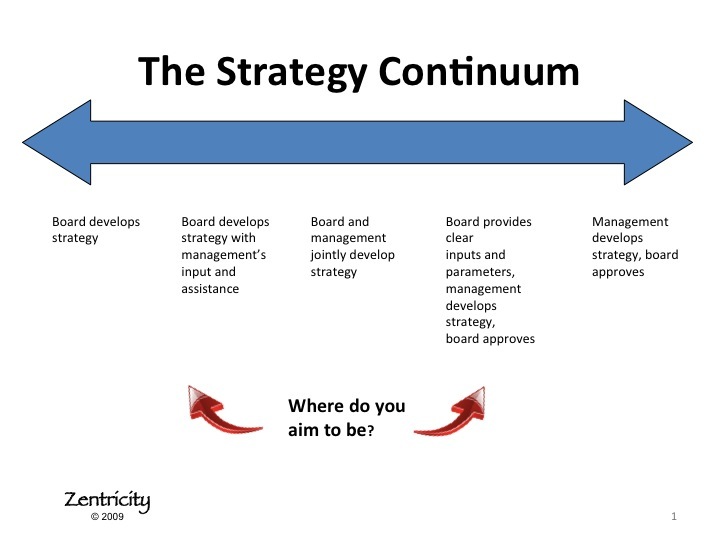 There is a continuum for strategic planning on which, at one end, the board does the actual planning work, and at the other end management does the work and the board approves the plan. I sit on the board of a small not-for-profit – every employee bar the managing director is engaged in delivering the organisation’s services, and there are no administrative staff. If the board (led in this instance by the MD) does not undertake the strategic planning work, there is no-one else to do it, so we are clear about where on the continuum we sit. In contrast, when I was a much younger lawyer and company secretary, and sat in the corner of the board room of a top ten listed company taking minutes, we had the luxury of a strategic planning department who brought the pretty-much-final version of the annual plan to the board, which asked some token questions and then approved the plan. Again, the board was clear about its role in the process. There is not any objectively right place to be on the continuum. The board’s role in strategic planning will depend on the company’s circumstances and internal capabilities. There is no point in management developing the initial strategy if there is not sufficient capability or experience within the management team. The positioning on the continuum needs, in my experience, to be the subject of an explicit discussion and agreement between board and management. With due deference to the ASX guideline, the suggestion that a board should “provide input” into the strategy process is not quite explicit enough. Some clearer statement will help – for example, that the board will provide clear guidelines and parameters within which the strategic plan will be developed. Finding and agreeing the right position on the strategy continuum will not remove the need for iteration, which is essential to gather the contributions from everyone who has some value to add, from either board or management. But it should negate the ping-pong effect and lead to a smoother and more effective process.